We called upon superlative chefs to divulge the secrets of their favorite Valentine’s dishes. They kept it relatively simple for us, so that not-so-confident cooks can follow along, too. Create an impressive four-course meal with the following appetizer, side, main dish and dessert. Or mix and match what you make to suit your desires—that is, after all, the key word of the day. Two halves split from a whole. It’s a lovely metaphor to start your Valentine’s feast. While just about all butter lovers like a good artichoke to get a meal going, Chef Jonathan Perno’s version of the appetizer elevates the dish from classic to exceptional. Not content to merely steam the flower and serve it with some lemon, Perno douses it in white wine, orange juice and just the right amount of spice. Butter won’t be the only thing that melts. 2) Scrub and trim the artichoke. Cut in half from stem to tip. Cut out the choke and small center petals from each half. Rub all cut surfaces with lemon or white vinegar to reduce oxidation. Either steam or boil in salted water until crisp-tender, about 30 minutes. A paring knife or skewer will have slight resistance when inserted into the heart. 3) Meanwhile, in a small saucepan, combine the orange juice, wine, shallot, bay leaf and peppercorns. Bring to a boil, then simmer until the sauce is reduced by 3/4. Strain out the solids. Return liquid to the pan and swirl in butter, 2 tablespoons at a time. Return to a very gentle flame to just melt the butter. Do not boil it or stop stirring, or the sauce will break. Salt to taste and keep in a warm—but not hot—place on your stove. 4) Once the artichoke halves are done, drain well on towels to dry. Get a heavy, oven-safe skillet wicked hot. Add olive oil and place the artichokes cut-side down in the skillet. Once their faces are golden brown, turn them over, add salt and pepper to taste, and put them in the oven for a few minutes to heat through. 5) Remove from oven, add garlic and chile flakes, and toss to coat. 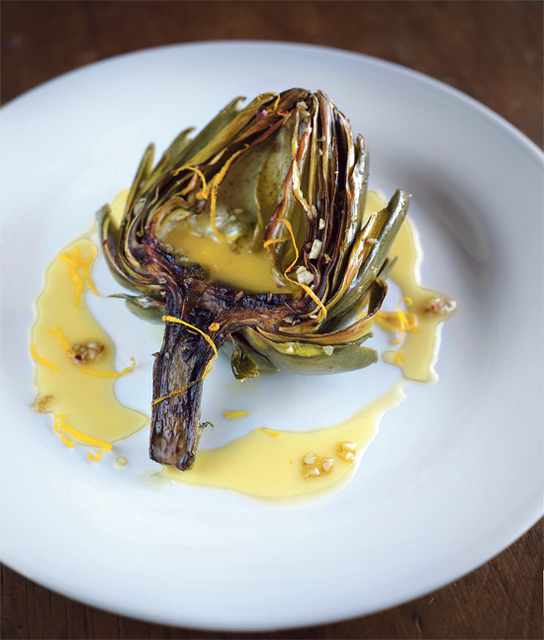 Place one half per person on a plate and drizzle with a very liberal portion of the beurre blanc over the artichokes, making sure it works its way between the petals and pools in the heart. Serve with a bowl for collecting spent petals. Make It the Main Dish: Serve this baby alongside some wilted greens and a splash of balsamic vinegar, and you’ve got yourself a healthy and hearty vegetarian main squeeze. 2) Spray an 8-by-8-inch pan with cooking spray. 3) Peel the beets. 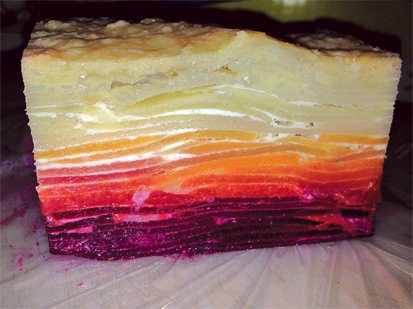 Using a mandolin, slice the beets 1/8-inch thick and layer them evenly in the pan. Season with salt and pepper. Barely cover with cream. 4) Peel the sweet potato. Using a mandolin, slice the sweet potatoes 1/8-inch thick and layer over the beets. Season. Barely cover with cream. 5) Repeat each step with the rutabaga, celeriac and potatoes. It should fill the pan, but not quite all the way. 6) Cover tightly with plastic wrap, then with aluminum foil. (The taut plastic won’t melt and prevents the gratin from bubbling over. But if the idea weirds you out, just use foil.) Place the pan on a cookie sheet so if it bubbles over, it doesn’t drip onto the bottom of the oven. Bake for 1 1/2 hours. 7) Remove the aluminum foil and plastic wrap, cover with an even layer of grated Parmesan, crank the oven up to 425 and bake uncovered for another 20 to 30 minutes, or until the cheese is golden and bubbly. Admittedly, this recipe isn’t for beginners. But if you’ve got the equipment and the love, it’s perfect for Valentine’s dinner. Chef Maxime Bouneou has been making this decadent dish for about 15 years. A European through and through, he exclusively uses metric measurements. While we’ve done our best to convert ingredients to U.S. standards, we’ve also included the original metric amounts for those of you who like precision. If you’re looking for a more manageable meal, consider using Jennifer James 101’s root vegetable gratin as a main course. 1) Combine the pasta ingredients in the bowl of a food processor and pulse until fully incorporated. The dough will be dry to the touch, but you should be able to form a ball out of it. (You can mix the dough by hand in a bowl if you don’t have a food processor.) If your dough turns out too dry, add a small amount of water. If your dough is too wet or sticky, add more all-purpose flour. 2) Set aside and let rest for about 30 minutes. 1) Sauté the diced shallot in a saucepan in a little butter over medium to low heat, stirring often. When the shallot is translucent, add the minced tarragon leaves. Remove from heat. 1) Cut the dough into 4 even pieces. Slightly work each piece with a rolling pin on a dusted surface, sprinkling with a little flour before rolling. 2) Crank each piece through a pasta machine on the widest setting 5 to 10 times, until the dough comes out smooth and uniform. 3) Decrease the roller gap of the pasta machine by 1 setting and roll each piece of dough. Repeat, reducing the roller opening 1 setting at a time until the thickness is about 1/32 inch. 4) You now have 4 sheets of pasta. Spread one sheet on a floured work surface, and use a pastry brush to lightly coat the pasta with water. 5) Place dollops of filling on the pasta sheet about 3 inches apart. 6) Cover with another pasta sheet, making sure the edges align properly. Using your fingers, press the top sheet around the filling, chasing air bubbles as much as possible. 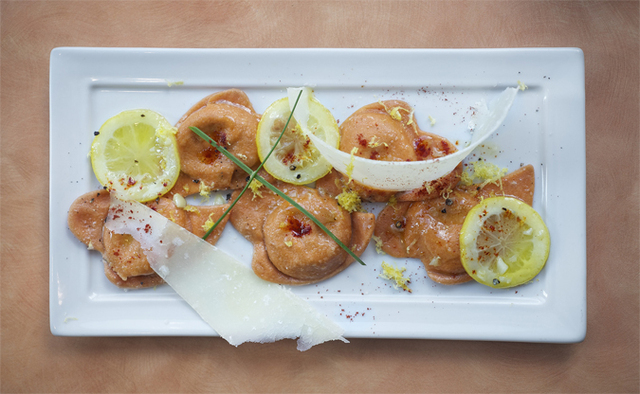 7) Cut the ravioli with a heart-shaped cookie cutter, making sure to keep the filling in the center of each piece. 1) In a sauté pan on medium heat, melt the butter and add the minced garlic, lemon juice and zest. Season to taste and remove from heat. 1) Bring salted water to a simmer in a large pot over high heat. Add ravioli in batches, about 4 to 5 minutes for each batch. Remove them with a slotted spoon and place them in the sauce. 2) Cook the ravioli in the sauce on medium heat for another minute or so. Serve immediately. The last flavors of a romantic meal aren’t complete without a lingering note of cacao. And this isn’t any old chocolate recipe. Though it’s fairly simple to make, Chef Christophe Descarpentries’ mousse au chocolat is a triumphant bridge between airy and rich. It’s marvelously deep and textured but not at all overpowering—and just the thing to inspire the remainder of your evening. 1) In a medium bowl, beat the cream and sugar until whipped. Set aside. 2) Melt the chocolate over a double boiler. (You don’t need fancy equipment. Just rest a heat-safe glass or metal mixing bowl on top of a simmering pot of water.) Remove from heat and fold the whipped cream into the melted chocolate. Set aside. 4) Separate the egg whites from the yolks, reserving one egg yolk in a small bowl. In a large stainless steel bowl, beat the whites with a pinch of salt until stiff. Set aside. 6) Fold in 1/3 of the stiff, beaten egg whites to the chocolate mixture. Do not use a whisk. Add the chocolate mixture to the rest of the beaten egg whites and fold gently until incorporated. 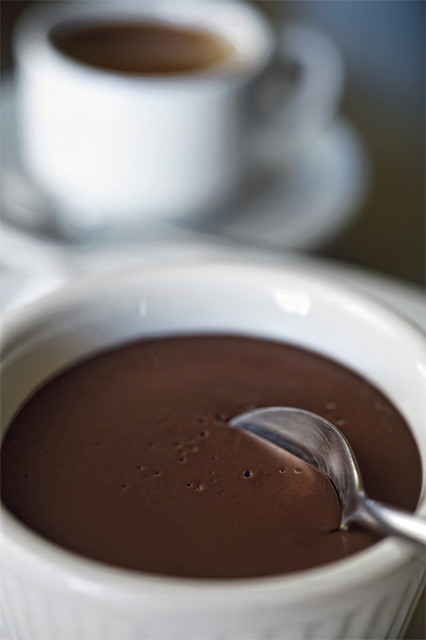 7) Spoon the chocolate mousse mixture into individual ramekins. Refrigerate for at least 2 hours before serving.